When you have infants or toddlers around--either your own, or those coming to your daycare or preschool facility--one of your most important tasks is keeping cross-contamination to a minimum. If young kids (with or without dirty diapers) are part of your daily routine, AMMEX Changing Table Paper can play an important role in protecting surfaces where multiple children (and their multiple germs) will be gathering. Use it to cover surfaces beyond the changing table, too--it gives you an extra level of protection for all kinds of activities that have the potential to get messy. It even serves well for art projects: Spread out a sheet, hand out the crayons, and let young creativity take over. 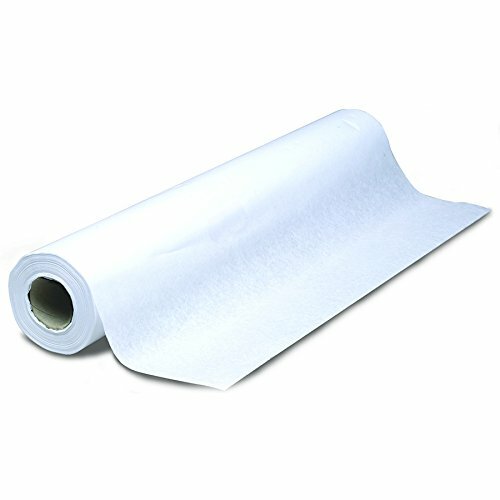 AMMEX Changing Table Paper is moisture-resistant and sold in 225-foot rolls in both 14- and 18-inch widths to fit most changing tables, 12 rolls per case. The convenient roll-style paper lets you use as much or as little as you need. Don't let germs get the upper hand. With AMMEX Changing Table Paper, you will always have a clean slate. 225-foot rolls in both 14- and 18-inch widths to fit most changing tables. 50 to 100% recycled content. This sanitary roll of paper is great for covering changing table pad and keeping the changing area clean. Ideal for child care centers.